Hattie McDaniel from this movie was the first black actress ever to win an academy award, but she wasn't even allowed to go to the premier in Atlanta because of racism. This annoyed Clark Gable so much that he threatened to boycott the premiere unless she could attend. He later relented when she convinced him to go. The first scene to be shot was the burning of the Atlanta Depot, filmed on 10 December 1938. If there was a major mistake during the filming, the entire film might have been scrapped. They actually burned many old sets that needed to be cleared from the studio backlot, including sets from The Garden of Allah (1936) and the "Great Wall" set from King Kong (1933). The fire cost over $25,000, and yielded 113 minutes of footage. It was so intense that Culver City residents jammed the telephones lines, thinking MGM was burning down. Scarlett was stunt doubled by Aline Goodwin and Lila Finn, while Rhett was doubled by veteran stuntmen Yakima Canutt and Jay Wilsey. This tale of the Old South from the start of the Civil War through to the period of reconstruction focuses on the beautiful Scarlett O'Hara. Before the start of the war life at the O'Hara plantation, Tara, could only be described as genteel. As for the young Scarlett, she is without doubt the most beautiful girl in the area and is always the belle of the ball. She is very much looking forward to a barbecue at the nearby Wilkes plantation as she will get to see the man she loves, Ashley Wilkes. She is more than a little dismayed when she hears that he is to marry his cousin Melanie Hamilton and in a fit of anger, she decides to marry Melanie's brother. War is soon declared and as always seems to be the case, men march off to battle thinking that it will only last a few weeks. Now living in Atlanta, Scarlett sees the ravages that war brings. 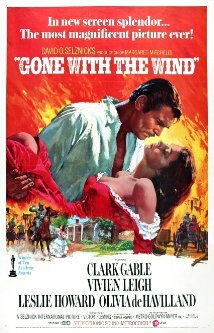 She also becomes re-acquainted with Rhett Butler, whom she had first met at the Wilkes barbecue. Now a widow, she still pines for the married Ashley and dreams of his return. With the war lost however, she returns to Tara and faces the hardship of keeping her family together and Tara from being sold at auction to collect the taxes. She has becomes hardened and bitter and will do anything, including marrying her sister's beau, to ensure she will never again be poor and hungry. After becoming a widow for the second time, she finally marries the dashing Rhett but they soon find themselves working at cross-purposes, their relationship seemingly doomed from the outset.